Author and illustrator of early chapter books, including the illustrated Secret Dinosaur series. Creative writing teacher for Kent Adult Education. 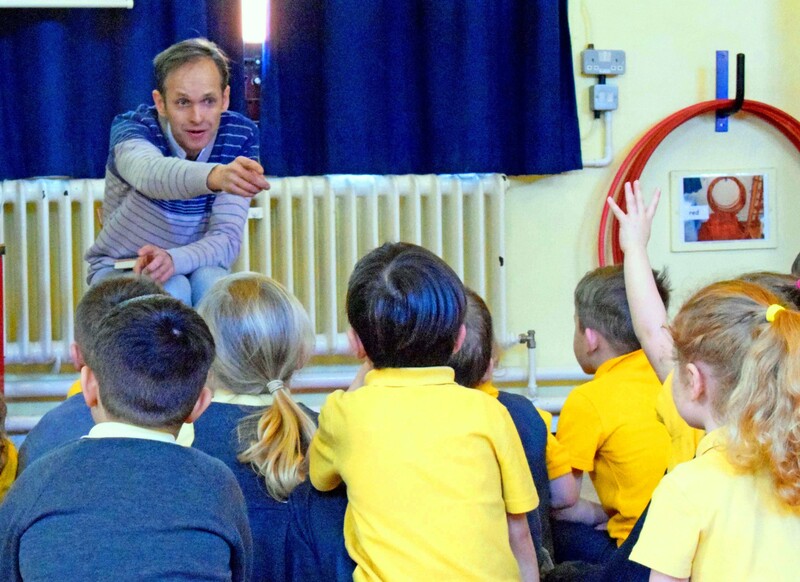 During visits I often combine whole school assemblies with smaller classroom workshops - inspiring the children to read for pleasure and to develop their creative writing skills. I have a track record in engaging more reluctant readers, and encouraging boys as well as girls to enjoy reading. The books highlighted here are perfect for enrichment of the dinosaur topic at KS1/ KS2 and the Saxon topic at KS2. Freedom for Bron (Saxon fiction) also includes themes of migration, friendship and acceptance of others. Sessions: My sessions are fun, friendly and very interactive. They include quizzes, role play, group story telling (where the whole class gets involved in telling a dinosaur story), on-the-spot illustrating/showing how my character illustrations developed over time, and of course reading from the books. However no two visits are exactly the same - I liaise closely with the organising teacher and tailor visits accordingly - this is particularly true if a teacher wants to incorporate work they are already doing on dinosaurs or Saxons, or if they have already used or intend to use the literacy activity sheets that accompany my books. World Book Day 2019 - I'm now booked for this year's World Book Day, but do get in touch for availability around that time. 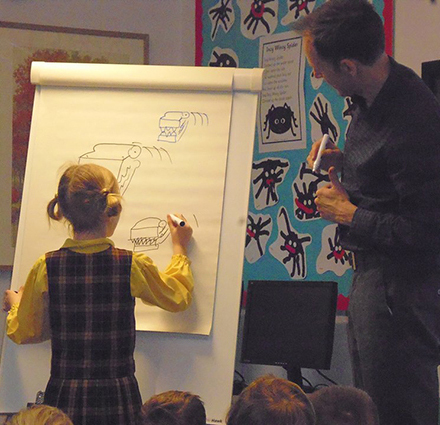 About Me: When I'm not busy writing, I teach creative writing to adults twice a week. I love drawing, walking, family time and watching Dr Who! I visit dozens of schools each year (all areas - last year I took the night train from London to Cornwall to visit schools, it was great!). 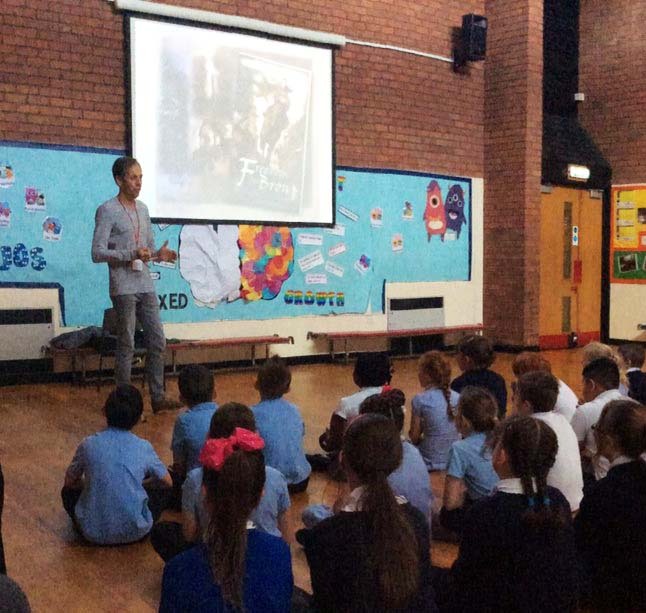 If you'd like me to put you in touch with a school I have recently visited, do let me know. Freedom for Bron is among titles shortlisted for one of the most respected book awards for children in the UK: the Hull Children's Book Award 2017 for KS2, run by Hull City School Library Service. The shortlist of 5 is drawn up by a panel of teachers and librarians who survey all new titles for children published across the UK over the past year. I was thrilled and delighted when The Secret Dinosaur - Giants Awake! was selected by Hodder Education to feature in their Literacy Course for primary schools. The course includes fiction by a few selected writers, including Michael Morpurgo and Roald Dahl (and respected educationalist/poet Pie Corbett - who visited my school and taught me in the late 1980's - what great company to be among!). The course book uses the opening of The Secret Dinosaur as an exemplar of how to engage children into a story, encouraging them to read for pleasure. The Secret Dinosaur: Giants Awake! What if the dinosaurs came back? Impossible - that's what Marlin Maxton thinks until he makes a discovery that plunges him into an incredible adventure. "A fast-paced adventure, full of action, excitement and great characters"
The dinosaurs are back! But not everyone is pleased to see them... A ruthless new enemy is heading their way and Marlin Maxton must act quickly to protect his friends. A tale of friendship and the desire to belong, this adventure resonates with all children and immerses readers in the Anglo-Saxon era, with plenty of detail about the myths and culture of that time. The best dinosaur adventure yet! A mysterious stranger arrives at the museum and the Dinoteks attempt a dangerous mission to rescue a friend.